Physicist Daniel Sweger refutes the catastrophic AGW hypothesis in his paper The Climate Engine, showing that CO2 has a negligible effect upon climate and that water vapor acts as a negative feedback to global warming. 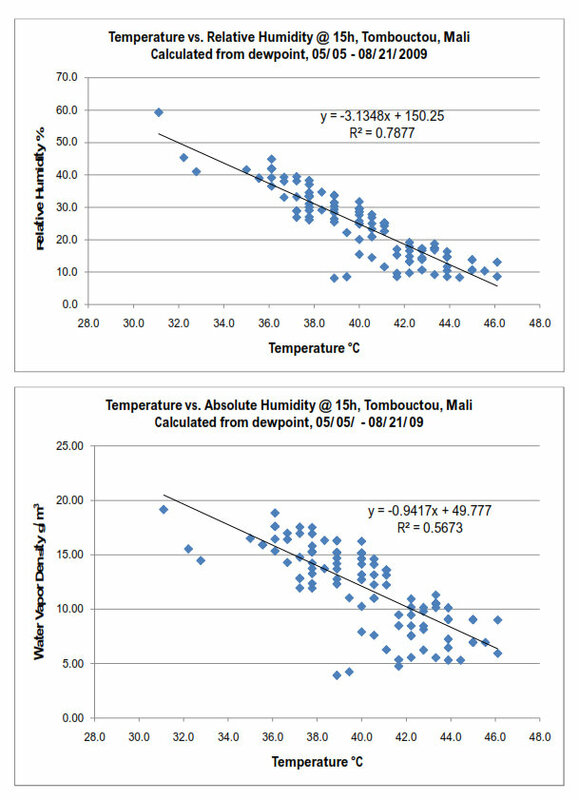 Dr. Sweger uses data from 3 locales to show an inverse relationship between humidity and temperature. He notes, "In the positive feedback mechanism as proposed by the global warming proponents this behavior would be reversed. Then the data would show a positive relationship between moisture content and temperature. But it does not. As suggested before, data is the language of science, not mathematical models." The role of water vapor in determining surface temperatures is ultimately a dominant one. During daylight hours it moderates the sun’s energy, at night it acts like a blanket to slow the loss of heat, and carries energy from the warm parts of the earth to the cold. Compared to that, if carbon dioxide has an effect, it must be negligible. It is also clear from the data presented above that water vapor acts with a negative feedback. The data clearly shows that the relationship between the amount of water vapor in the air and temperature is negative; that is, the higher the amount of water vapor in the atmosphere the lower the surface temperature. In that regard, it almost acts as a thermostat. As the air cools as a result of an increasing moisture content in the atmosphere, there is a decrease in the amount of water vapor produced by evaporation. Eventually this decrease of the level of water vapor being introduced into the atmosphere results in a decrease in moisture content. At this point more sunlight reaches the earth’s surface resulting in higher temperatures and increasing evaporation. In the positive feedback mechanism as proposed by the global warming proponents this behavior would be reversed. Then the data would show a positive relationship between moisture content and temperature. But it does not. As suggested before, data is the language of science, not mathematical models. Dr. Daniel M. Sweger, AB (Physics, Duke University, 1965) and Ph.D. (Solid State Physics, American University, 1974) has been a research scientist at NIST, where he was active in a variety of research areas, including cryogenic thermometry, solid state and nuclear physics, and molecular spectroscopy. He also operated a computer software business and performed consulting for the US Army. He is now semi- retired and is an adjunct instructor at National College of Business and Technology (www.ncbt.edu), where, among other subjects, he teaches Environmental Science. Rather than expecting equations to control reality, we should insist that reality control our equations. earth cooler- atmos gases cool and at night slow down cooling. Maybe there's an answer someone has come up with, but I've always wondered: if water vapor feedback is positive as the modelers insist, why do the models need CO2 to cause runaway global warming? Wouldn't H2O alone be sufficient: simple random warming events cause the amplified H2O effects and warm us more, increasing the H2O effects, warming us more, and so on, even without any CO2? Yes that's true and if the water cycle feedback was positive the planet would have spun out of control billions of years ago. All net positive feedback systems are inherently unstable and that's why they aren't found in nature. Bah humbug! M. Mann is bound to have a dedoclimaticconcentric study that refutes not only that postulate, but also Einstein's equation. Since JB will not respond to this maybe soneone can. CO2 increases drought resistance, nutritional content of plants, and the size and efficiency of root systems. The out-of-control SPIN is all generated by the out-of-control effor-fat carbon bureaucrats in the UN and their over-stuffed, er, overstaffed minions in the various terrorist governmental hangers-on. What an interesting example of synergy. I recently posted a video on YouTube - http://www.youtube.com/watch?v=Y2K1uHvfaek - that outlined the results of an experiment that I performed that showed the same results--the presence of water in a climate system produces an overwhelming negative feedback against diurnal changes in temperature and overall those climate systems that are more humid are on average cooler than arid climates. Beyond that, and something that I didn't get into in the video, is the fact that the phenomenon of "moist convection" that drives the strong upward convection currents that creates thunderstorms operates in direct opposition to the idea that warm moist air somehow resists the forces of nature that compel it to ascend and cool while it dwells near the surface of the earth driving a heating feedback loop. Anyway you might take a look at the video if you have interest. Thanks very much for that video - I'm going to put it in a new post. Fantastic job!! re equations - Maths can only represent reality when applied properly to a given situation. When maths determines the physics then you get the situation climate science is in at the moment. Unphysical, failed hypothesis, imaginary "physics", counter to observation, politically correct dogma. Atmospheric back radiation warming earth's surface is unphysical. The obviously negative feedback effect of water vapour having to be reversed because James Hansen decided he was modelling a positive feedback, so that our emissions of CO2 would therefore need "controlling". The IPCC assumes that when CO2 levels rise, they cause the atmosphere to warm and that a warmer atmosphere in the lower atmosphere allows more H2O into the atmosphere. The additional H2O causes additional warming so H2O acts as a positive feedback to increasing levels of CO2. The IPCC claims that this works to amplify levels of H2O. The true physics of the lower atmosphere is not as simple as all of this. In the lower atmosphere H2O is near saturation and much of the heat transfer is through phenomena other than radiation. In addition, weather, clouds, and Ocean currents play a big part. In the upper atmosphere the situation os reversed. If anything added to the atmosphere causes warming in the lower atmosphere by means of insulation the upper atmosphere must cool. It is in the upper atmosphere where most of earth's absorption band IR radiation takes place. In balance the earth looks like an equivalent -18C black body at roughly 17,000 feet above the ocean. For the earth to be gaining energy this temperature must drop. If this temperates drops so will the capacity to hold H2O in the upper atmosphere. If levels of H2O drop in the upper atmosphere so will the atmosphere's insulation properties so temperatures rise back up in the upper atmosphere cooling the earth. So in the upper atmosphere H2O acts as a negative feed back to any imbalance in so called green house gases, making our climate inherently stable in regard to changing levels of green house gases. Such climate stability has been in place for at least a billion years and has allowed life, include man, to evolve. The best evidence is our existence. Some of what I am saying comes from the work of Ferinc M. Miskokzi. This means that adding CO2 to the atmosphere, in the amounts that man is suppose to be adding it, has no effect on climate. Throwing good money after bad is never wise. All GCMs fail because the grid scale resolution you post (same image used in my book) is far too coarse to resolve things like tropical thunderstorm convection cells (which is why GCMs cannot resolve Lindzens adaptive iris, and therefore why CMIP5 still gets the water vapor feedback wrong, therefore why they still predict an equatorial troposphere hot spot when there isn’t one), or clouds. So this formal appeal for GCM consolidation has very little real appeal. First rule of holes if you are in one and want out: stop digging.